Shimmering gold and vibrant red remind us every time of Christmas atmosphere, the very moments when we are fervently decorating the Christmas tree trying to use as many festive colors as possible. 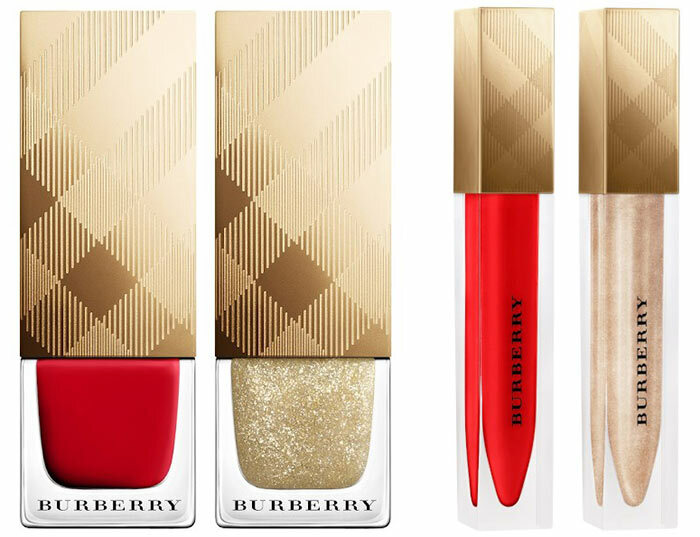 But the combination of these two festive colors is not only the Christmas time indicator, but also the signature shades of our favorite cosmetics brand Burberry. 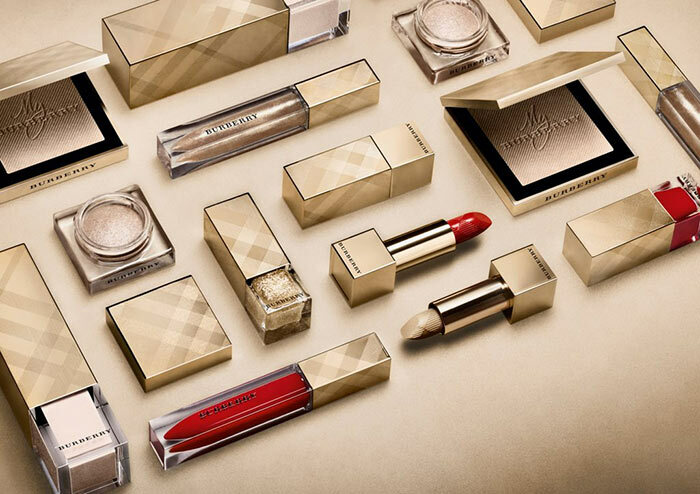 The Burberry Festive Beauty holiday 2015 makeup collection that will hit the counters in November 2015, is dedicated to My Burberry fragrance, while a range of other makeup products packed in golden cases are complementing the star. 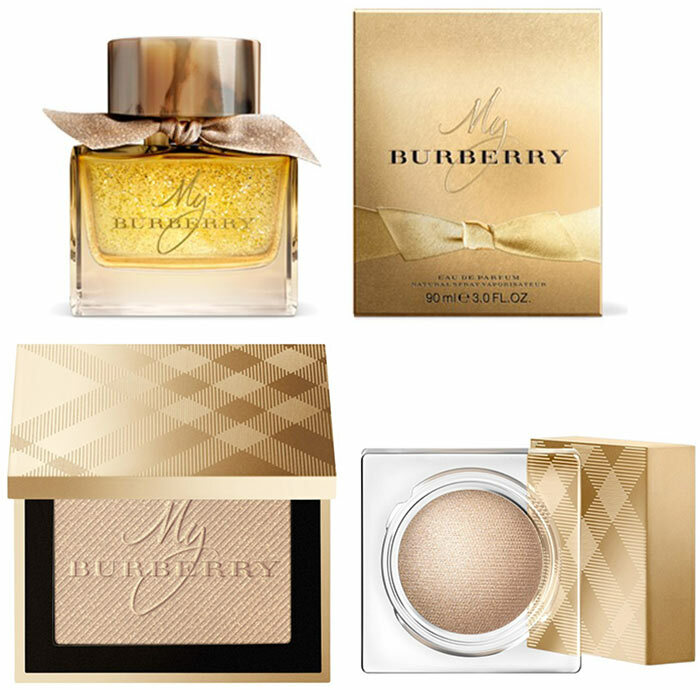 Get acquainted with the collection and make your ideal Christmas choice purchasing the products right now on Burberry’s official website	or on Nordstrom! First you will be enchanted by the honey-beige glass case of the fragrance, which is romantically decorated with a bow, and then you will notice those magical golden snowflakes floating in the liquid. Afterwards, the scent inspired by the iconic Burberry trench coat and London garden after rain will instantly wrap you with some magical atmosphere. The high notes of Sweet Pea and Bergamot mixed with heart notes of Geranium, Golden Quince and Freesia and enriched with base notes of Patchouli, Rain-Tipped Damask and Centifolia Roses will be perfect for any occasion. Burberry’s iconic glowing skin slogan is completely revealed thanks to this fresh glow luminous fluid base that can be used either alone for natural appearance or over foundation for impeccable skin. The 55-percent water-infused primer will immediately hydrate and even your skin to perfection. Glowing skin festival keeps on making its way to our face by Burberry’s limited edition luminising powder, infused with high notes of My Burberry fragrance. Your cheeks covered with soft silky texture and fragranced with London garden after rain notes will definitely become so pleasant to kiss and so pleasant to touch. At first sight so fragile but in reality long-lasting and crease-free, this eye color cream will cover your lids with a luminous veil, making them so happily smile. Apply it alone or blend it with other shades, in any way your eyes will never stop smiling. 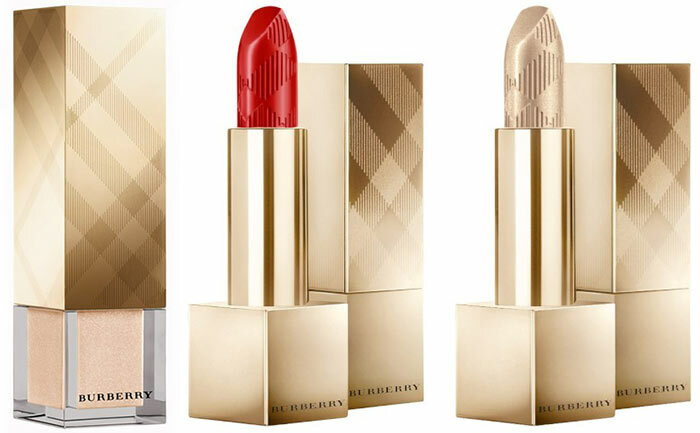 Housed in Burberry’s iconic golden tubes, these two satin-finish lipsticks of military red and festive gold shades are infused with the blend of rosehip, tea and lavender, giving your lips a cushiony feeling. You can easily change the pigment shade from faint red to vibrant one, by just gliding it with multiple layers on your lips. Christmas is a time for sparkles, twinkles and colors. Why not combine them all on your lips by just acquiring these military red and festive gold lip glosses? Your wet, mirror-like lips will create an illusion of heavy texture but you will definitely have one secret ” my lips are so feathery! The iconic military red and festive gold shades are smoothly passing from your lips to your fingernails. These runway nail polishes including moisturizing and strengthening components are to become your faithful companions even after Christmas.